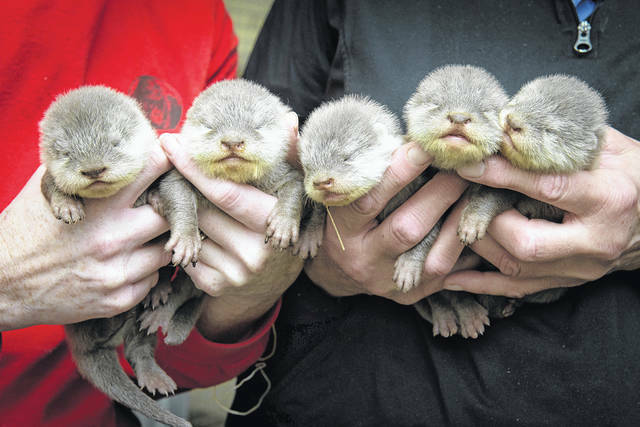 Pictured are the five Asian small-clawed otter pups born on Jan. 26 at the Columbus Zoo and Aquarium. 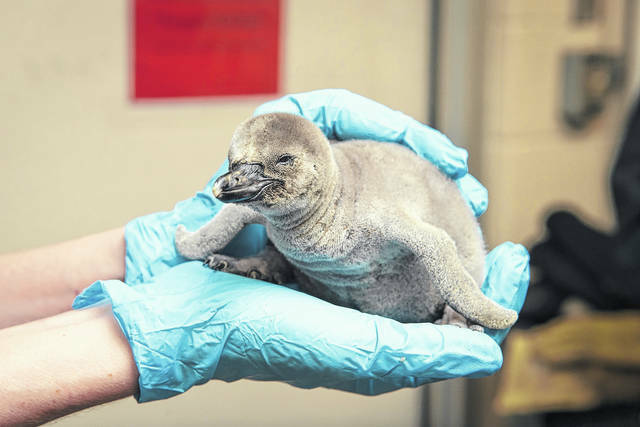 Pictured is the Humboldt penguin chick born on Feb. 19 at the Columbus Zoo and Aquarium. 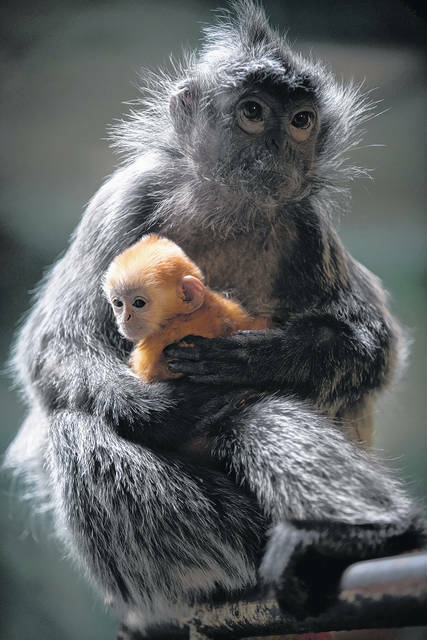 Pictured is the silvered leaf langur baby born on Feb. 16 at the Columbus Zoo and Aquarium. The Columbus Zoo and Aquarium is proud to announce the arrival of seven babies, representing three at-risk species, born in late January and early February. The newest additions — five Asian small-clawed otter pups, a silvered leaf langur baby, and a Humboldt penguin chick — each contribute to maximizing genetic diversity within their species and sustaining populations of these animals facing serious threats to their future in their native ranges. Kicking off the winter baby boom was the arrival of five Asian small-clawed otter pups, born during the early morning hours of Jan. 26. Native to coastal regions from southern India to Southeast Asia, Asian small-clawed otters are often threatened by habitat destruction, pollution and hunting, which places them at risk in their native range, according to the International Union for Conservation of Nature (IUCN). The pups, three males and two females, were born to first-time parents, Gus and Peanut. Peanut was born in 2014 and came to the Columbus Zoo in April 2017 from the Woodland Park Zoo in Seattle. Father, Gus, was born in 2008 and arrived at the Columbus Zoo from the Bronx Zoo in 2014. The young pups are all thriving under the watchful eyes of both of their parents and are expected to be on view to the public later this spring. The arrival of these pups is another significant achievement for this species at the Columbus Zoo. Last year, a male pup named Triton was born to parents, Asta and Oscar, and was the first to be born at Zoo in 14 years. Both the births of Triton and of the recent litter were significant for the breeding recommendations outlined by the Species Survival Plan® (SSP), a program coordinated by the Association of Zoos and Aquariums (AZA) to manage sustainable populations of threatened and endangered species. The Columbus Zoo was also proud to welcome a female silvered leaf langur baby on Feb. 16. The female was born to mother, Patty, and father, Thai. Patty came to the Columbus Zoo from the Bronx Zoo in 2007 and has given birth to seven offspring. Thai came to the Columbus Zoo in 2015 from the San Diego Zoo and has fathered a total of four infants. Patty, Thai, and the newest langur arrival are currently on view in the Asia Quest region. The baby is easy to spot as langurs are born bright orange, as opposed to their adult counterparts with black fur and silvered tips. This difference in coat color is believed to encourage other female langurs to assist in raising the young, a practice called allomothering. In their native ranges, silvered leaf langurs (Trachypithecus cristatus) can be found in areas including Brunei, Indonesia and Malaysia. The species’ populations in these countries are decreasing due to habitat loss as lands are cleared for oil palm plantations or destroyed by forest fires. Langurs are also hunted for their meat or taken for the pet trade. The pairing of Patty and Thai was based on an SSP recommendation, and the birth of the baby will play an important role in helping manage this at-risk species. Silvered leaf langurs are listed as “near threatened” by the IUCN due to population declines caused by habitat loss. The arrival of this langur baby at the Columbus Zoo is an important part of sustaining the langur population among AZA-accredited zoos, certified related facilities and conservation partners. Rounding out exciting baby animal arrivals at the Columbus Zoo this winter was the hatching of a female Humboldt penguin chick on Feb. 19. After much deliberation, the keepers in the Shores region named her “Her Majesty Gertrude Sprinklebottom,” or Gertrude for short. Gertrude is the 30th Humboldt penguin chick to hatch at the Columbus Zoo. The egg was laid by parents, Katja and Hans, but Gertrude is being raised by another pair, Asela and Chirriante, who is fostering the chick. Asela was born in 2012 at the Columbus Zoo, while Chirriante was born in 1992 in Dresden, Germany. Both penguins are being attentive parents and are currently keeping Gertrude within her nest box. Guests can expect to see Gertrude on view once Asela and Chirriante are comfortable with allowing the chick to wander outside of the nest box. This newborn chick is an important addition to the Humboldt penguin species, the populations of which are declining in their native habitats due to threats including environmental variability and human-wildlife conflict. The Columbus Zoo and Aquarium is one of only 19 facilities in North America that participates in the AZA’s Humboldt Penguin SSP breeding program, of which parents Katja and Hans are a high priority breeding pair. All three of these recent births assist in maximizing genetic diversity, managing demographic distribution and help to further enhance the sustainability of species that are at risk or threatened in their native ranges. These new arrivals also further demonstrate the Zoo’s unyielding commitment to conservation initiatives, both locally and globally. For more information about conservation initiatives at the Columbus Zoo, please visit https://globalimpact.columbuszoo.org/about.